I initially wanted to feature a whole bundt cake but couldn’t get the right caption. This picture just features a slice of the cake. Please forgive me. A Bundt cake is simply the name used for a dessert cake baked in a Bundt pan or a round baking pan with a tube in the middle with fluted, decorated sides. They are typically made from butter/shortening or dense, rich cake recipes, such as the Butter or Pound cake. Bundt cakes are versatile and keep well. They need little embellishment and can be simply served with fruit or drizzled with a glaze or dusted with powdered sugar. Very few are frosted or filled. The aluminum Bundt pan was invented in 1950, by H. David Dalquist, founder of Nordic Ware Bundt Pans, at the request of members of the Minneapolis Center of the Hadassah Society. They were interested in a pan that could be used to make kugel, a Jewish dessert. They had old ceramic cake pans of somewhat similar designs but wanted an aluminum one. Dalquist created a new shape and added regular folds to make it easier to cut the cake. The women from the society called the pans “bund pans” because “bund” is German for a gathering of people. Dalquist added a “t” to the end of “bund” and trademarked the name. Bundt cake can be made in many variations. But the techniques are still standard. All you really need is a bundt pan which I have no doubt that you can find at your local kitchen shop. I added my own twist using Gin for that richness. You can use other hard alcoholic drinks such as whiskey, bourbon, or liqueur for that matter. Or you can leave it out altogether. The choice is yours. I also used orange juice but you can substitute it with skim milk or non-dairy milk. Preheat oven to 350 degrees F.Grease a 9-inch ring or a 6 cup bundt pan and line the bottom with greased parchment (baking) paper. Mix the oil and sugar until very light and smooth. Slowly incorporate the eggs. Add the orange juice,Gin,zest, and vanilla. In a different bowl, whisk flour with salt. Add flour to the egg mixture. 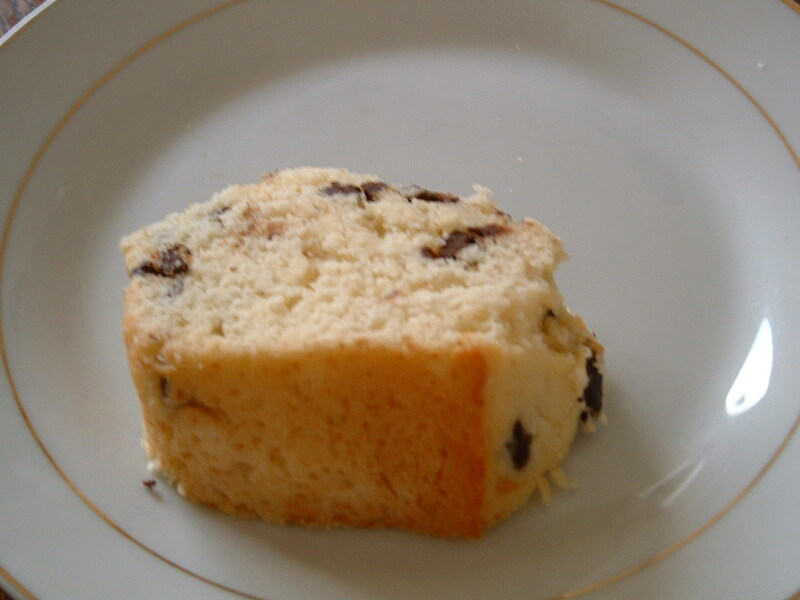 Fold in chocolate chips Spoon into the cake pan. Bake for about 45-50 minutes, or until the cake comes away from the sides of the pan and feels firm on top. Test the center by piercing with a thin skewer – it should come out dry. Cool in the pan for a few minutes, then turn onto a wire rack to cool. This entry was posted in Desserts and tagged bundt cake, cake, chocolate chips, Desserts, gin, orange juice. 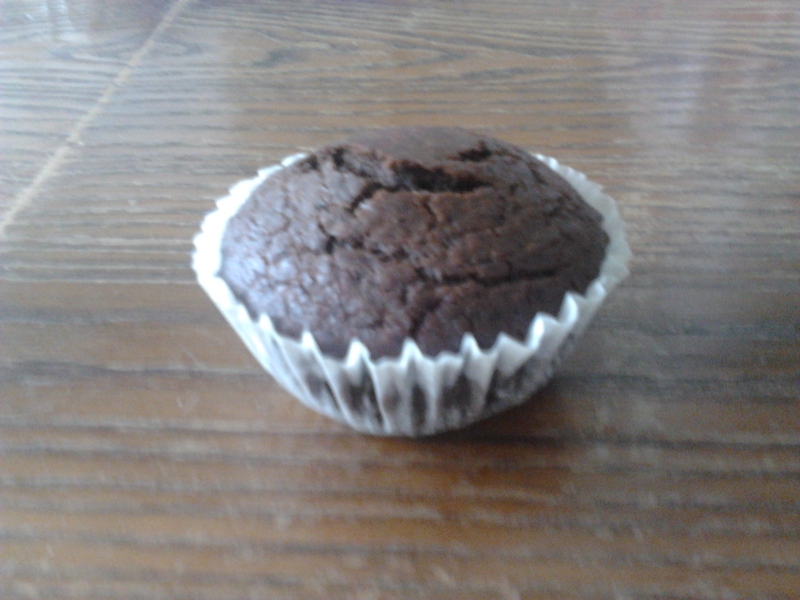 Preheat your oven to 350 degrees F. Place paper liners in 12-cup muffin pan. In a bowl, whisk the flour,cocoa powder, ginger, baking powder, chili powder,cinnamon, cardamom, baking soda, and salt together. In another bowl, whisk the brown sugar, eggs, oil, and vanilla until well blended. Place teabags in hot milk. Let it sit for a minute or 2 until the flavors dissolve in the milk. Slowly pour and whisk milk in with the liquid mixture. Add egg mixture to the flour mixture until well combined. Evenly distribute batter into prepared muffin tin. Bake for 23-25 minutes until a toothpick inserted into the center comes out clean and the muffin springs back when lightly pressed. Optional: Top with sifted confectioners’ sugar when cooled. Mix 2 tbsp cocoa powder with 1 tsp cinnamon and 1/4 tsp ground nutmeg together in a small bowl. Sift lightly over top of the sugar (using a stencil for accuracy, if you want) to add a bit of extra spice. This entry was posted in Breakfast, Dairy, Desserts and tagged chai tea, chili powder, chocolate, cinnamon, Dairy, ginger, muffins, spicy. Soup is a very comforting and satisfying meal. Soup can also be one of the healthiest and most enjoyable meals you eat if, you do it at home. There is nothing that does it for me on cold rainy evenings other than a bowl of piping hot soup. Most canned soups are high in sodium and fat, but when you make it yourself, you can control the sodium level and can create a very healthy soup. 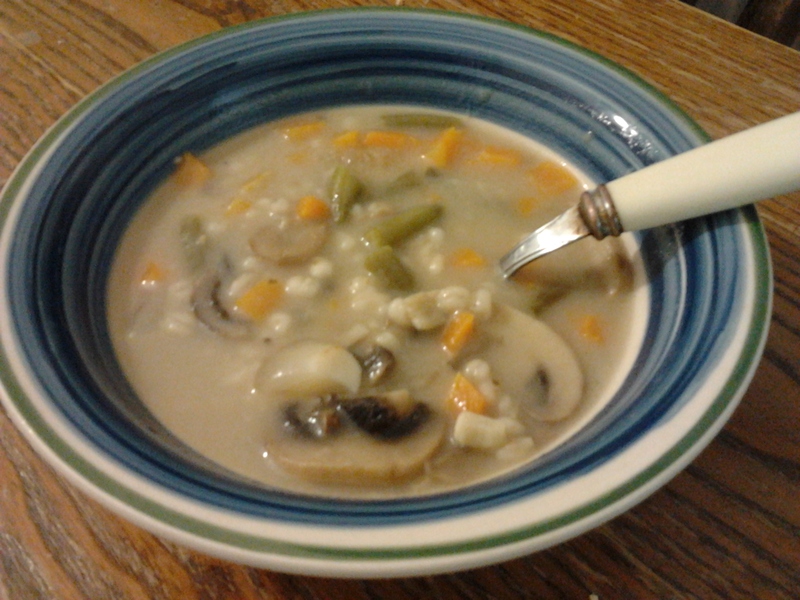 I’ve made mushroom barley soup several times but failed in getting the right consistency. Akin to certain soups, mushroom barely soup requires a rue. While its not meant to have the consistency of a sauce, its not suppose to be too watery either. Mushroom barley soup is very warm and hearty. I’ve seen similar recipes that include chicken,beef,turkey, and whatnot. I needed a break from poultry My recipe is simple and classic with basic ingredients. This soup serves well with a garden salad or toasted rye bread. You can toast bread crusts and use them as soup croutons. But I’m happy eating this soup as it is. Heat the olive oil in a large pot over medium heat. Add the onion and garlic. Cook until soft. Add the carrots and celery and cook until tender, about 5 minutes. Add the sliced mushrooms and cook until they are soft. Dissolve flour and water and pour into pot. Add the vegetable broth, bay leaves, and fresh thyme. Simmer for about 10 minutes. Stir in the barley and cook for 25-30 minutes on low heat. Discard bay leaf, season with salt and pepper and serve hot. This entry was posted in Soup, Vegetarian and tagged barley, carrots, Celery, Mushrooms, onions, soup, string beans, vegetable broth, vegetarian. I have no doubt that you’ve seen many pumpkin soup recipes made in many variations. So what is so different about mine? As usual, I added my own twist to it using spices that insinuate Far East Asia. 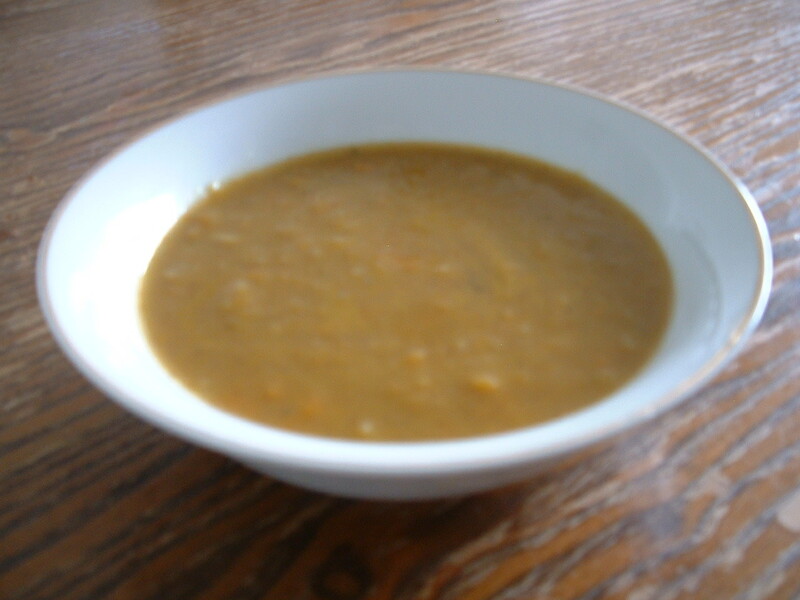 Rather than making a pumpkin pie this year for Thanksgiving, I made pumpkin soup instead. I decided to take a shorter route and use canned pumpkin puree rather than making my own from scratch. Rather than using soy milk, I used pears to give that soup a rich creamy texture. At first, I thought pears was a ludicrous idea. I’ve heard people using apples in their soup so why should pears be any different? But it worked out at the end and you don’t really taste any pears in the soup. You can garnish your soup with roasted pumpkin seeds or pecans/chestnuts which I regrettably didn’t do. This soup is best served hot on rainy cold winter days but if you are crazy like me, you can eat this soup in the the summer too. Heat olive oil in a pot over medium flame. Add onions and saute till translucent. Add chopped carrots and pears. Season with salt pepper and spices. Saute till soft. Add pumpkin puree and stir for 2 minutes. Lower flame. Pour in broth and cook for 15-20 minutes. Using a hand blender, puree pumpkin mixture till smooth. Simmer uncovered for another 20 minutes. Season with salt and pepper. Serve hot and garnish with some roasted pumpkin seeds,pecans,or cashews. This entry was posted in Gluten Free, Soup, Vegetarian and tagged broth, coriander, Curry, pears, pumpkin, pumpkin seeds, roasted pecans, soup. Some of you were probably wondering if and when I was going to publish a post relating to Thanksgiving. For some of you who are not aware of American holidays, Thanksgiving is a national holiday celebrated around November in the USA and on October in Canada. This holiday was originally celebrated as means to give thanks at the conclusion of harvest season. While Thanksgiving has some historic roots in religious traditions, it is generally celebrated in a secular manner. You may wonder what does turkey have to do with anything. Although juicy and tender butterball turkeys are the main cuisine of today’s Thanksgiving celebrations, these birds were NOT the most popular centerpieces on the first Thanksgiving tables. In 1621 when the Plymouth colonists and Wampanoag Indians celebrated the first Thanksgiving, they were consuming a lot more food than just turkey. Roasted goose was popularly eaten around harvest season. When the pilgrims arrived in America, they discovered turkey and decided to nominate roasted turkey as the main cuisine because wild turkeys were more abundant and easier to find than geese. I decided to make and serve turkey legs. I would have preferred a whole turkey but my oven is not big enough to fit on it. Besides I was only preparing a meal for 2. Whole turkeys are not available on a daily basis where I live. You would have to go to your local butcher shop or supermarket and order it in a week advance. Turkey legs,however, are available in packs of 2 or 3. Turkey legs had to suffice for now. This recipe that I’m about to share with you would work on a whole turkey. In fact, I would use this recipe for a whole turkey and include a herb margarine filling inside. 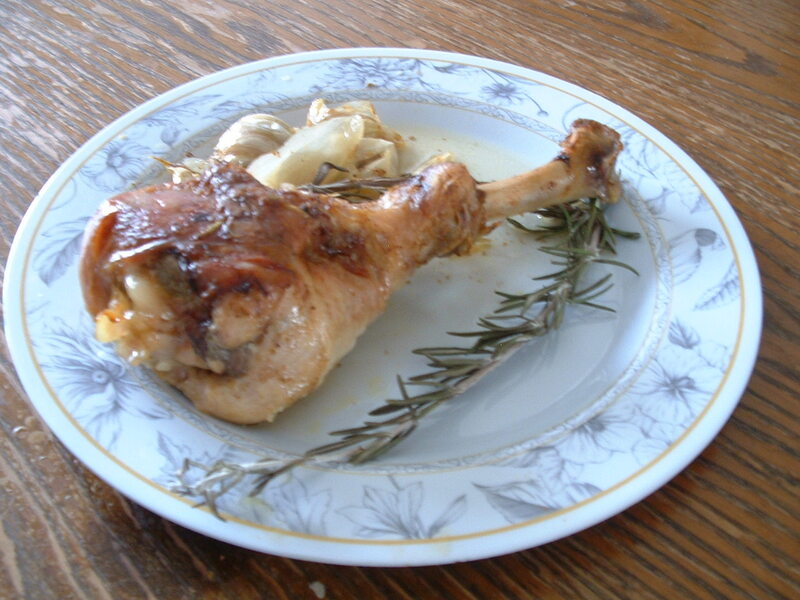 But if you want your Thanksgiving meal to be less of a hassle, turkey legs will just do. You can combine elegance and simplicity. I know Thanksgiving has passed but its never too late for a turkey recipe. This turkey dish serves well with pumpkin pie and cranberry apple crisp along with some roasted potatoes. Preheat your oven to 300 degrees F. In a bowl, whisk olive oil, lemon juice,spices,and herbs in a bowl until well combined. Place quartered onions and garlic in a baking dish. Lay turkey legs on top. Coat each turkey leg evenly with the paste. Bake covered for the first 2 and a half hours. Bake uncovered for the remaining 30 minutes. Serve hot. This entry was posted in Gluten Free, Meat and tagged meat, poultry, Thanksgiving, turkey, turkey legs. Feeling sorry for my hubby’s inability to eat anything pertaining to nuts, I made this chicken specifically for him. 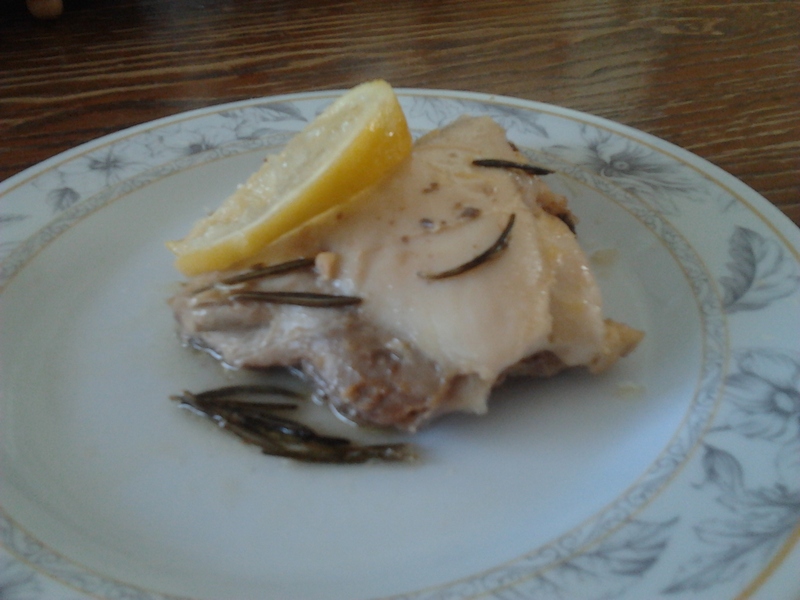 Unlike my roasted lemon chicken, I created a lemon marinade and de-skinned the chicken. A lot of people are concerned about cooking chicken without the skin. The skin helps preserve the moistness in the chicken. Without it, the chicken is vulnerable to drying up quickly. Not only does a marinade add flavor and retain the moisture but it also helps to cover the pan as the chicken is cooking as well as basting it every so often. Unless you plan on eating the chicken immediately, I suggest you keep the chicken covered at all times. 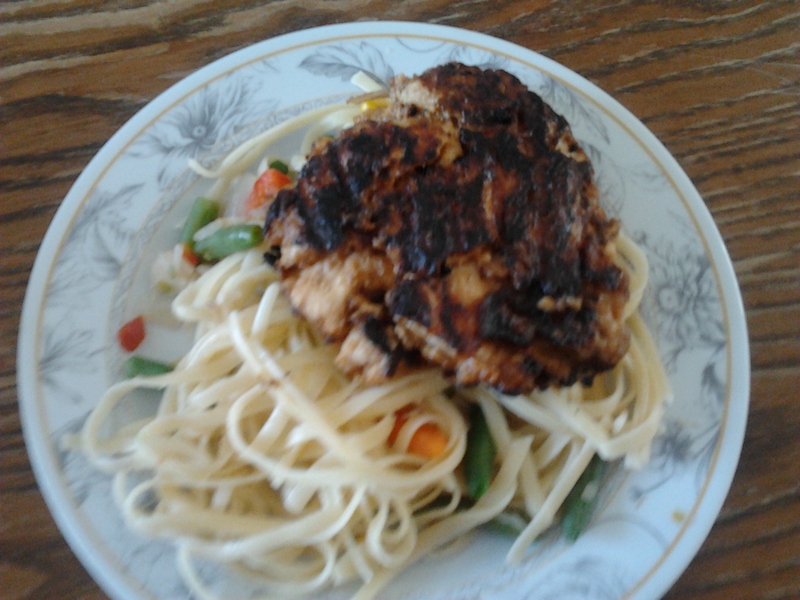 I used dark meat as it tend to stay moist longer than chicken cutlets. Serve this chicken with rice or any steamed green vegetables. Lay out chicken thighs on a baking dish. Sprinkle chicken with salt and pepper. In a small bowl, whisk lemon juice,zest,olive oil, and rosemary. Pour over chicken. Let it marinate for a couple of hours in the refrigerator Preheat oven to 300 degrees F. Bake chicken for 45 minutes to an hour or until tender, basting it from time to time. Serve hot. Garnish with lemon slice. This entry was posted in Meat and tagged Chicken, lemon, Marinade, meat. Okay. I admit that I could have captured that photo better. But as they say, looks can be deceiving. This philosophy can be also applicable with food. I don’t recall ever publishing a recipe related to South East Asian dishes. This is a first. My mother would make Thai chicken using the store bought spicy Thai peanut sauces. There is nothing wrong with that. I just feel it would be more adventurous to make your own which is not that difficult to do. This recipe is dedicated to her as she requested for a Thai peanut sauce recipe. The ingredients are very basic which is a huge plus for me. A lot of presumably exotic looking dishes only require one-step simple ingredients that most of you already have on hand. Since coconut is used in most South East Asian dishes, the recipe to making a peanut Thai sauce does require coconut milk. Due to my allergies to coconut, I had to forgo this condiment as use soy milk instead. The sauce,however, did come out a bit more watery than what I have liked. Don’t let my coconut allergy prevent you from using coconut milk though. Just because I can’t digest certain ingredients doesn’t mean you shouldn’t use them either. My peanut Thai sauce is a bit on the spicy side because I used hot sauce. If you don’t like spicy ingredients, you can leave that out. Some of you may be wondering how could I have not considered my hubby’s nut allergy when making this chicken. Well, put your worries at rest because he didn’t have any. I had to reduce the portion amount. I also made him something special as well. I will feature that chicken recipe on my next blog post. This chicken can be cooked in many different ways. Some like to broil it, roast it, or simply bake it. I decided to grill my chicken using a grilling pan since I don’t own a proper grill yet. If you have grilled chicken before, this technique does apply. I normally marinate chicken/meat before I grill it. That is why I used my peanut Thai sauce as a marinade. This chicken serves well with my stir fry recipe or rice. Leftovers can be used in salads or to make sandwiches. Combine the ingredients for the peanut Thai sauce in a bowl. Whisk ingredients till smooth. Place cutlets in a shallow bowl. Pour Thai sauce over the chicken and mix well till chicken is completely covered. Set aside and allow it to marinate for at least an hour. Heat oil in a wide non-stick grilling pan over a high heat. When the oil is hot put in the chicken in a single layer, laying them out flat. Grill for 3-4 minutes on each side. Serve hot. This entry was posted in Gluten Free, Meat and tagged chicken cutlets, coconut milk, grilled chicken, lime, meat, Peanut butter, soy milk, Thai sauce.